Beets are botanically related to spinach. Did you know that one-third of the world’s sugar supply comes not from sugar cane, but from a special variety of beets known as the sugar beet? Beets also have the distinction of being very rich in red pigment, and they’ll stain your hands if you’re not careful. In fact, borscht, a traditional Russian soup, is coloured red with beet juice… While most beets are deep red in colour, there are a number of beet varieties that range in colour from white to yellow to red. Beets are both sweet and earthy tasting and pair well with other root vegetables as well as with tangy-sweet fruits like pineapple. In fact, one variety of beets is known as the spinach, or leaf beet. It is grown for its greens, which are actually more nutritious than the root itself. There’s even one variety, known as the Chioggia beet, which has red and white concentric rings. 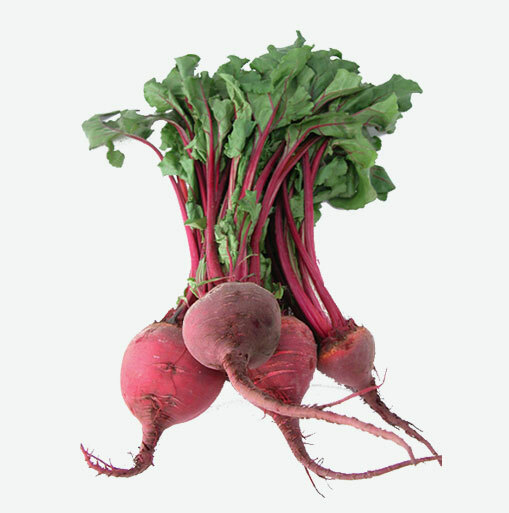 Beets are a great source of folate, the “B”vitamin known for its role in preventing birth defects in growing fetuses. Beets also provide a good source of iron, potassium and magnesium which are three important minerals that are necessary for balancing blood pressure and fuel the body with energy. When you are shopping for fresh beets, choose smaller beets over larger, tougher beets, and pass over any beets that are cracked, shriveled or look very dry. If the beet greens are still attached to the root, they should be crisp looking and not wilted or slimy. Storing beets are as simple as placing them in a perforated plastic bag, separate from the greens, for up to three weeks in your crisper. Before using beets, wash them thoroughly and make sure that any soil is removed before cooking. You can enjoy beets raw on salads or sandwiches or cook them in any variety of ways which includes boiling, baking, sautéing with other vegetables, or even pickling. Beets need to be cooked with their peel on to preserve nutrients and to prevent their deep red colour from leaking out, which turns them brown, making them unappetizing in appearance. While cooking these delicious vegetables, remember to leave about half an inch of the stem on so that the pigment doesn’t leak out of the top. Add a tablespoon of freshly squeezed lemon juice or vinegar to the pot which helps to preserve the colour of the beets. Once your beets are cooked, peel the skin off while wearing gloves, unless you don’t mind having your hands temporarily stained a deep red.